Hotel Elguea is located on the northern coast of Villa Clara Province, ninety minutes by taxi from Varadero, and ten minutes from El Salto and Ganuza beaches on the border of Matanzas and Villla Clara province. This is an especially pleasant way-stop when traveling the north coast highway with bonus of getting a vigorous massage or steep in the therapeutic hot tubs. 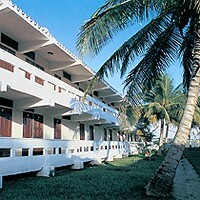 Its wonderful climate makes the 1-star Islazul Elguea an excellent place to harmoniously combine holidays and health care. The vital treasure of the Elguea are its waters, that are reputed to be a rich source of minerals, contributing to overall health and quality of life. Elguea waters are hypermineralized, meaning they have high contents of chlorine, sodium, and bromine salts, and low contents of radon, and sulfide. Their mean temperature is 45°C and they flow at a rate of 25 litters per second. Due to all these properties, its waters are prescribed for relaxation, revitalization, anti-stress, fitness, against obesity, respiratory, circulatory and neurological problems. The 135 air-conditioned guest rooms are perfectly comfortable for a night's stay and have been fitted with bamboo furnishings, satellite TVs, telephones, in-room safes, and small refrigerators. And the bathrooms now boast modern fittings. Active-minded guests can take to the large swimming pool, two tennis courts, and (if you can a quorum) the volleyball and basketball courts. And the spa features massage rooms, a simple gym, and various rooms for treating medical conditions, rather than beauty. But be prepared to have the facilities to yourself. The Elguea Hotel has 99 rooms equipped with air conditioning, private bathroom, phone, balcony or terrace, satellite TV, twin beds, radio, power 110V/60Hz. 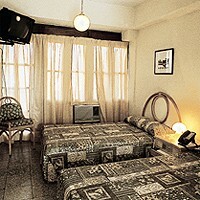 Elguea is 90 minutes drive from Varadero and 10 minutes away from the beaches of Salto and Ganuza.